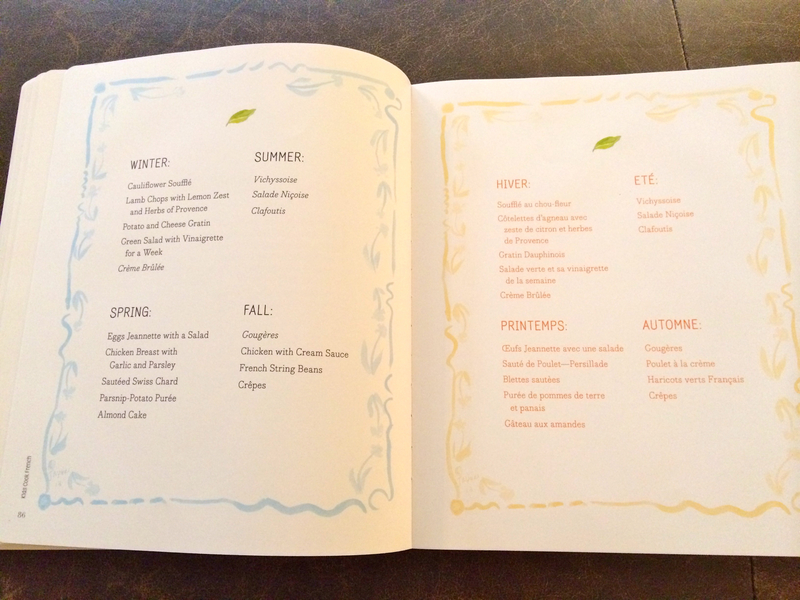 Kids Cook French is a beautiful cookbook written by Claudine Pépin and illustrated by Jacques Pépin. We love this new book! Little M and I have spent a lot of time looking through the pages and marking the recipes we want to make. I can’t wait to try the Ratatouille and the Apple Tarts with Almond Frangipani and Little M has his eye on the Cheese Fondue. The classic French recipes are written in English and French. It has been fun to read the recipes together and practice our French. There aren’t any photos of the food, but the illustrations are gorgeous and so colorful. The recipes are simple enough to encourage both adults and children to try their hand at cooking a French inspired meal. Little M and I love cooking together and are always looking for new recipes. Claudine’s “note for parents” in the book is lovely, she truly believes in healthy food for the family and doesn’t feel that there should be separate “kids meals” – which is a sentiment I agree with wholeheartedly! She encourages readers to try the recipes with their kids and adapt and adjust them to their tastes and lifestyles. Little M and I plan to do just that – Cheese Fondue anyone?